Finished! After choosing the scan, spent two months before starting work on it :sweat:. But it's already. Since we are here in the summer, I preferred working in this idea, it's something entertaining and colouring . Saki-xan was all the time to answer about this project, so... My present for you! Difficulty: Moderate. Many flowers X-P, mmm, I had to remake the scan in the center (strips). 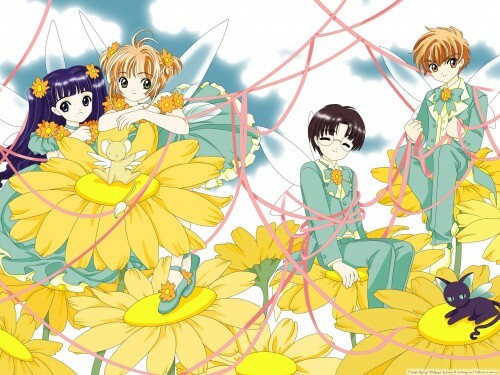 Sakura and Syaoran's hairs were a bit complicated, too. Fantastic! I love everything! the outlines are sooooo thin and smooth! and the coloring! OMG! I always loved tha pic and now you vectored it! XD XD fav fav fav! absolutely amazing. The vector is really neatly done. The colors are sharp. It's lovely! Wow~~ That's a very amazing vectoring! XD XD The color choice is wonderful [sharp yet easy-on-the-eye]! This is really lovely, and peaceful looking. Wonderful. I wish Yukito and/or Yue were in there, though, but I guess that's the scan's fault. I love wallpapers of these four!